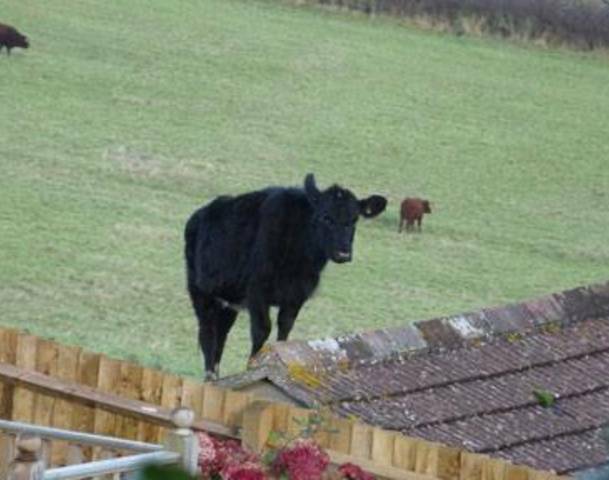 10 minutes out: Roof Cow – Next Hipster Trend is what's HAWT, NEXT! Raw milk has peaked, along with “real food” and (ew) organ meat, but there is still a small window to take raw to the next level. It’s going to take a bit of doing, but then again, that’s kind of the point. You will need a cow. We recommend Guernsey over the run of the mill Holstein (higher butterfat and Guernseys are also gingers, which is always hot). You will need to enclose the area somehow so your cow doesn’t meet a grisly and surprising (for the cow) death, and also provide some sort of shelter for the creature. A picture of a meadow also can’t hurt. Finally, you will need a bucket and, most importantly, a stool. The stool is absolutely critical to the whole operation. Preferably something made by Cistercian monks somewhere. There’s probably a few more things involved in owning a Roof Cow, but we think we’ve probably covered the major stuff. Oh, wait—food and water. That’s also really, really important. Roof cows (like all cows, really) will need to be milked twice a day, once early in the morning (you can make this your last stop after the club) and once in the late afternoon (which everyone knows is the best time of the day for being both pensive and wistful). It may seem like a lot of effort, but casually dropping a “I’ve gotta get back and milk my cow” line is bound to both turn heads and produce a few low breathy “ooohs,” which will make it all worth it.